A close up of the vignette with the inscription "North River, James Kent". A made for order earthenware plate printed in blue with the Standard Willow pattern. 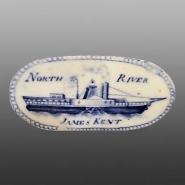 Printed in the border is an oval vignette, on which is inscribed "North River James Kent" along with an image of the steamship by the same name. The James Kent, an 180 ton steamship, was built by the Allaire Iron Works of New York City in 1823 and was launched in the Hudson River. It is presumed that the plate was part of a dinner service but it is not known when the dinner service was made for the James Kent, nor is it known who made it. It is possible that it was ordered for its maiden voyage and used to serve passengers on the ship. The ship is best remembered for having carried the Marquis de Lafayette during his triumphant return the US in 1824. Lafayette left New York and passed up the North River on the James Kent commanded by Commodore Samuel Wiswall.